Alfred Frederick, son of Joseph C. Frederick and Mary Betz, was born on May 1, 1836 in Columbiana County, Ohio and grew up in the Franklin Square area of Salem Township. As a young boy he helped his father with the coopering trade. On the 1860 Ohio Federal Census report, Alfred is enumerated with his cousin’s, Sarah Lepard’s, family in Seneca County, Ohio and is listed as a clerk. 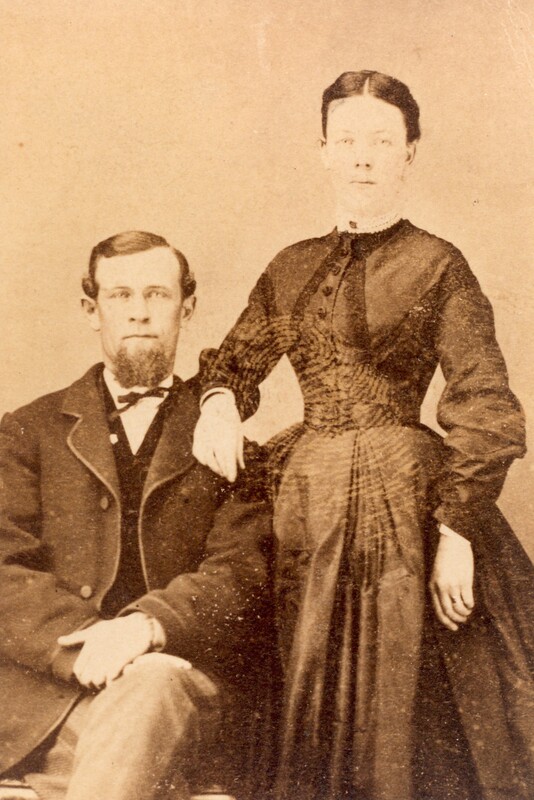 Alfred, referred to as Fred and Nick, by his family, returned to Columbiana County, Ohio and on October 22, 1868 married Lucinda B. Orr, daughter of William Morlan Orr and Nancy Cannon. The Frederick’s were living in the Franklin Square area in 1870 and Alfred was employed as a laborer. By 1880 Alfred and Lou had moved their family of five children to Fairfield Township and Nick had begun his long association with the railroad working as a brakeman. The Frederick family removed to Esplen, located in McKees Rocks, Allegheny County, Pennsylvania sometime after August, 1896, but before September, 1898 and lived at 614 River Avenue in Esplen. Early in September, 1898, Alfred was involved in a train accident in Youngstown, Ohio which caused him to lose one of his legs. On February 24, 1899 Alfred and Lou’s twenty-five year old son, William Walter Frederick died in a Youngstown, Ohio hospital. Alfred and son, Robert Bell Frederick, were both working for the railroad--Alfred as a switch tender and Robert as a flagman. Interestingly, my grandmother, Martha Marie Frederick, is enumerated as a “scool teacher” on the 1900 census and we never knew she taught! From old photographs and memorabilia that has been left, it appears that the Frederick family had a comfortable lifestyle. Lucinda certainly inherited her mother’s talent for sewing, which was passed on to her daughter, Martha Marie. She had a full collection of glassware in the Three Face pattern, which is highly valued today. The collection was passed on to Robert Bell Frederick and following his death, his widow, gave the glassware to the Salvation Army. About 1906 the family moved to Bellevue, Pennsylvania in Allegheny County. On December 15, 1909, Lucinda Orr Frederick died at home, at 67 Jackson, Bellevue, Pennsylvania of heart disease. Alfred continued to work with the railroad and at the age of 73 was still employed as a switchman. During his later years he lived with his son, Robert Bell Frederick and family in Bellevue and Avalon, Pennsylvania. Alfred Frederick died on February 9, 1927. To date I have not been able to locate his death certificate or the city where he died. There is no record in Pennsylvania. Old family photograph albums show pictures of him up to about 1924. Alfred and Lucinda Orr Frederick are buried in the Firestone Cemetery, located in the town of Columbiana, Columbiana County, Ohio. Their son, William Walter Frederick is buried nearby. Albert Frederick born July 21, 1869 in Franklin Square, Columbiana County, Ohio. Albert, listed as B. (perhaps Bert) L. Frederick in his mother’s obituary, was living in Chicago, Illinois when she died in 1909. He had one known child, Raymond Frederick. William Walter Frederick born October 2, 1871 in Franklin Square, Columbiana County, Ohio died February 24, 1899. According to an obituary, Walter died in a Youngstown, Ohio hospital following what was described as and attack of "virulent typhoid fever." He is buried in Firestone Cemetery, Columbiana, Ohio. Robert Bell Frederick born October 25, 1873 in Franklin Square, Columbiana County, Ohio died 1959 married on June 20, 1906 Mary Alice Bradley born October 1, 1880 died 1968. Robert was employed with the railroad and later with Hyland Patterson. Both Robert and Mary Alice are buried in Allegheny County Memorial Park Cemetery, McCandless Township, Allison Park, Pennsylvania. Their children were: William Walter Frederick born in 1907 in Pittsburgh, Pennsylvania died before 1909 in Pittsburgh, Pennsylvania; Donald Bradley Frederick born September 21, 1909 in Pittsburgh, Pennsylvania died on September 7, 1958 and married on May 14, 1932 Grace Olive Hunter born August 14, 1906 in Latrobe, Pennsylvania died August 22, 1986 in Lewiston, Maine; and Robert Bell Frederick, Jr. born in 1911 in Pittsburgh, Pennsylvania died in 1976 in Pittsburgh, Pennsylvania married Roxanne Anderson. Edna M. Frederick born August 24, 1876 in Columbiana County, Ohio died on January 25, 1961 and is buried in William Penn Memorial Cemetery, Pittsburgh, Pennsylvania, married Harry G. Ziegler and W.C. Gween or Givern. Had one child, a daughter, Mary A Ziegler born 1903 who married Robert B. Quinn in November 1925 in Pittsburgh, Pennsylvania. MARTHA MARIE FREDERICK born April 8, 1880 in Columbiana County, Ohio died January 6, 1971 in Pittsburgh, Pennsylvania married CHARLES EDWARD STARK. Tombstones of Alfred and Lucinda Frederick. Alfred Frederick’s place of death. Obituary of Lucinda Orr Frederick submitted to Rootsweb.com, Allegheny County, Pennsylvania Archives by Linda Hughes Hiser. Check out Susan McMahan's Frederick information on her Roots Web page. Thank you to my cousin, Donna Frederick Austin, and to Roxanne Anderson Frederick who supplied me with information regarding Robert Bell Frederick and Mary Alice Bradley and their descendants. And to my mother, Martha Stark Hughes for sharing her Frederick family memories.